I've put together a book, 'For These Times,' I consider a companion piece for those of us who seek in a certain direction. It deals with the nitty gritty of existence, where we find ourselves on the earth while asking 'where do we go from here?' If you find yourself alone in this search it is helpful. If you are not it still can be helpful. It is part of a process that not only ignites us onto a journey but leads us to authentic conclusions. The book consists of 320 pages of writings, such as is on the website, plus 60 drawings with companion poems. A wide range of thought is covered. The layout is basic and attractive and useful. Presently it takes some work to produce, as I am the production crew. As such the cost is $145, plus postage. If you could use a discount email or call me. If you can afford more also contact me. See the contact page to do so. Perhaps the future will bring the cost down. I'd also be happy to sign the book. 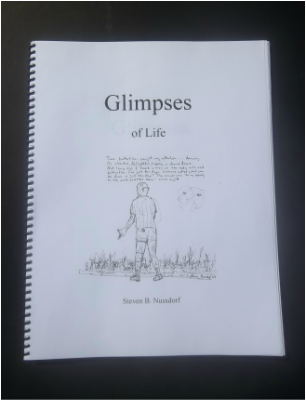 'Glimpses,' below, is my second book. It is just that, glimpses of life sketched from memory. For a time I developed a shorthand that could capture meaningful encounters and give them life beyond their brief time. When I see them I am connected with the past and the past lives. Hopefully this happens with others. Each 'glimpse' has a meaning, an observation and substance that lives on. 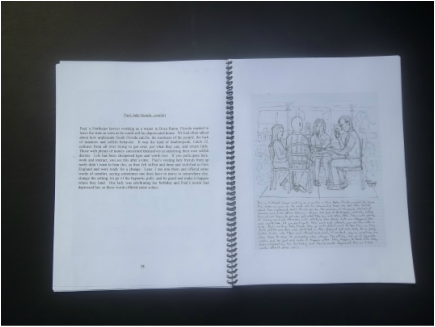 The book includes 46 memory sketches. They were done during the period of 2007 to 2011. Perhaps in the future I will attempt them again. 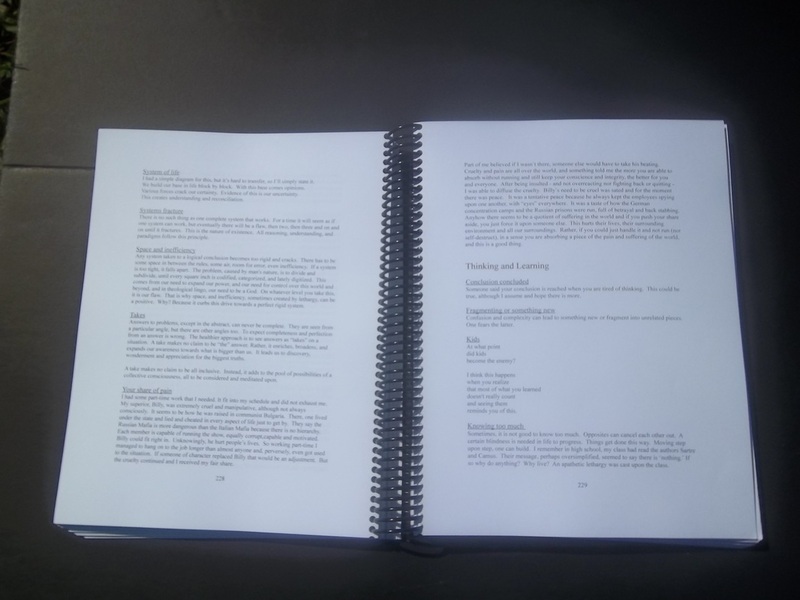 The book is 8 1/2" by 11" and is simply and attractively bound. It can be read as a regular book or a page can be randomly picked. Each drawing, whether light hearted or serious, can enrich understanding in its own way. It is a good book to have around. The drawings are on the right and their handwritten texts are printed on the left. The book costs $80 plus postage. Write to me on the contact page or email directly. in the timeframe of few years. Basically the drawings are memory based, but sometimes borrow from life, and sometimes are stylized. Such a balance can be kept only so long, and as such they are unique for me. They evolve from mere line to fully shaded and developed drawings. It is an honest and somewhat revealing look at what I experienced going through life at the time. In it's own way it's an attempt to reach out for commonality. 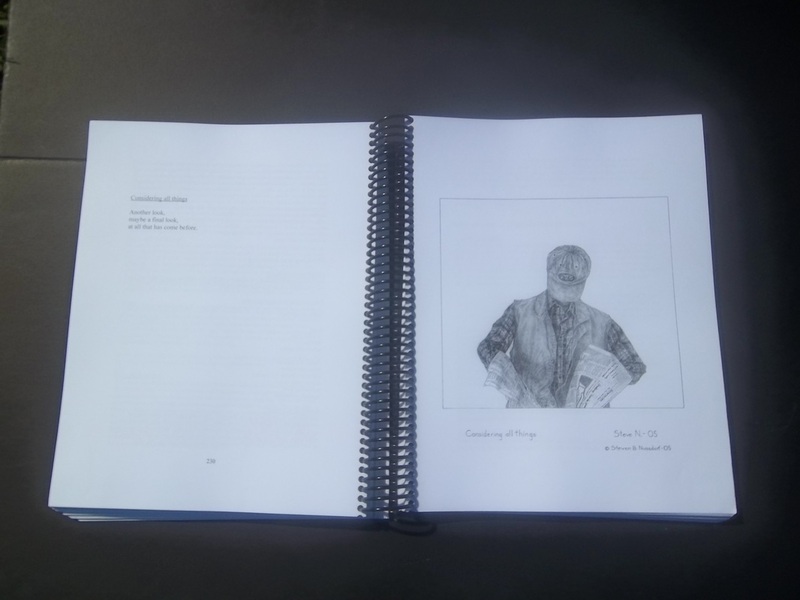 The book is attractively and simply bound. It is 8 1/2 by 11". and a poem. Some of the poems go into some depth. 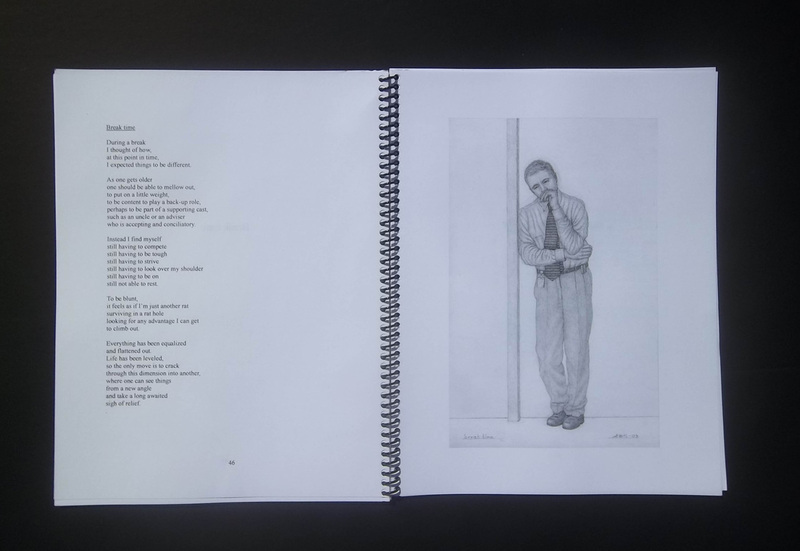 Poems are on the left, drawings on the right, both alluding to a 'moment' in time. I'm charging $78 for the book plus postage. Email me directly at Nussdos@yahoo.com or reach me on the contact page on the website. Take care. are all included. If your visually oriented this will peak your interest. It hopefully brings to life aspects of life. Over 100 drawings are shown. 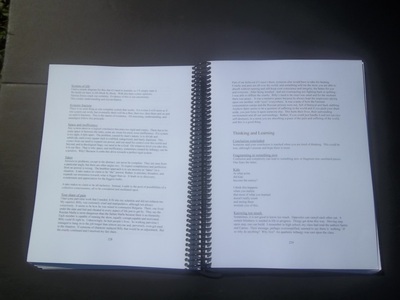 The book is attractively bound is of a manageable size, 8 1/2" by 11". The cost is $125 plus postage. Reach me through email at Nussdos@yahoo.com or use the contact page on the website. Have a good day.